The OPPO flagship is gradually taking over the market as we have many of their smartphones in the market now and still working on more, recently they unveiled one of the standard flagship Find X, not far from it they release another one call A5 and none of the two phones is sub-standard. In fact the review revealed that the two phones comes with 3D camera which is more better than original camera and as for Find X it has outstanding pop-up camera and face unlock feature instead of fingerprint. Now, it's coming to a notice that the next flagship is ready to be launch, as said "soon" that mean they are prepare to unleash it. The two handset is said to be coming with notch feature and some other nice features coming along, F9 and F9 Pro look similar mere looking at it but the specs clarify it difference. F9 will be coming in two colour variants Sunrise Red and Twilight Blue, the review disclose that the phone has shimmery glass back panel guided by a diamond-cut pattern. 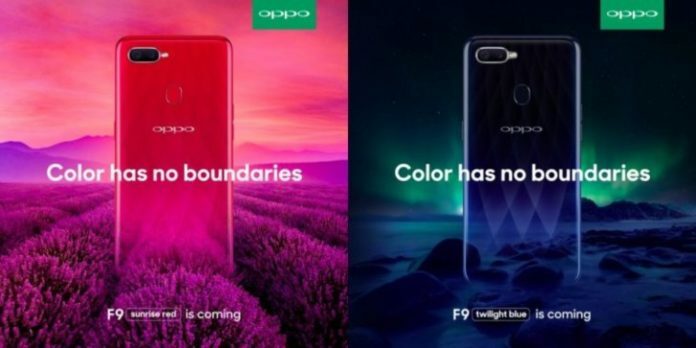 OPPO F9 and F9 Pro will be coming with dual cameras with LED flash and fingerprint sensor spotted at the top center. Let quickly reveal some of it specs, F9 Pro is expected to come with a tall 6.3 inch IPS display and MediaTek Helio P60 chipset back by 6GB of RAM. Easy selfie life with it camera along side with two dual camera setup and is going to powered by 3,400mAh battery capacity. The F9 full specifications is not fully available yet , just talking about it VOOC fast charging support and it nice impressive screen-to-body aspect ratio which is equally spotted with F9 Pro. As said earlier they have almost the same features with just little difference, but we should be expecting similar feature. Launching date is expected to be August 15th even though not the two phone will be launch the same day, it seems F9 will be coming first and thereafter F9 Pro.